The Dutch design studio Omega Architects has produced a 30m displacement motor yacht design for the owner of a Turkish yacht builder. 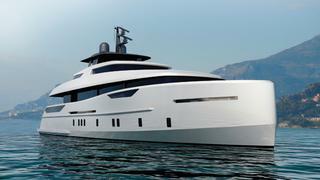 The owner of Alia Yachts, a custom yacht builder, asked Omega’s Frank Laupman to design his personal yacht. He required a compact vessel offering both performance and world-cruising ability. The yacht design’s plumb bow maximizes the length at the waterline for more interior space. Filled with light, thanks to glass insets in the curved bulwarks and tall windows, the interior accommodates four lower-deck guest cabins plus a private on-deck master suite located forward on the main deck. Full-height glass doors provide access to a private outdoor seating area. The crew area accommodates three cabins and a good size mess. The hull’s fine entry, in combination with wider lines aft, provides good displacement performance. Since the yacht has a tender garage, the generous flybridge deck offers space for al fresco dining and sunbathing.